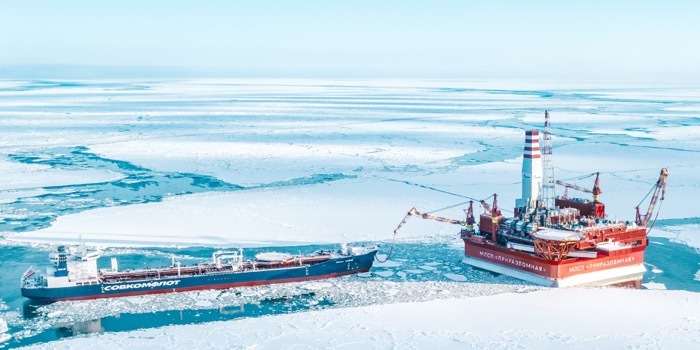 On April 10, the Arctic shuttle tanker Mikhail Ulyanov loaded the milestone 10-millionth tonne of commercial oil produced at Prirazlomnaya offshore platform in the Pechora Sea. This cargo of oil has become the 150th shipped from the platform since the transportation began in April 2014. Symbolically, it was also Mikhail Ulyanov which delivered the very first cargo of oil produced at the platform five years ago. Transportation of all oil produced at Prirazlomnaya platform is performed by Sovcomflot’s shuttle tankers Mikhail Ulyanov and Kirill Lavrov, 70,000-dwt each, which makes them the largest oil tankers built by Russian shipyards. Both vessels have been ordered by Sovcomflot at Admiralty Shipyards in St. Petersburg for the express purpose of servicing Prirazlomoye, the first offshore oil production project in the Russian Arctic (operated by Gazprom Neft). The design of these tankers reflects the challenging ice and navigation conditions common for the area of their operations. They were assigned an Arc6 ice class and are capable of independently sailing through the ice 1.2 metres thick. Both Mikhail Ulyanov and Kirill Lavrov fly the national flag of the Russia and have St. Petersburg as their port of registry.